Millions of drivers are needlessly sitting in traffic as they're failing to grasp a basic point of the Highway Code. When a two-lane road cuts down to one, such as at the end of a dual carriageway or approaching road works, many drivers take a very British approach of joining the back of a queue - rather than using all of the road for as long as possible. The Highway Code suggests that, in situations like this, drivers should continue in their lane until they reach the lane closure. At this point, drivers should take it in turn to 'merge-in-turn' - one behind the other, like a zip. 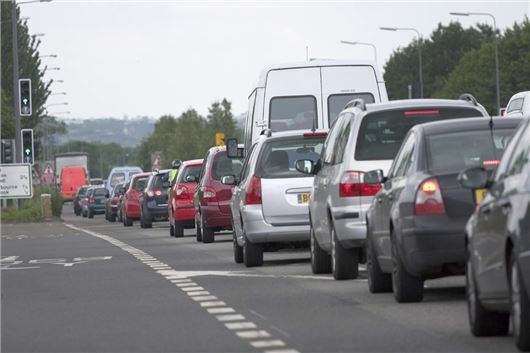 A survey of 22,000 drivers by Halfords Autocentres reveals that a shocking 70 per cent of Britain's drivers believe they should get in the open lane 'as soon as possible'. This extends traffic jams as drivers aren't utilising all of the road space. The discovery isn't surprising, since 34 per cent of those surveyed admit to not consulting the Highway Code since passing their driving test. A survey last year by IAM Roadsmart revealed that many drivers displayed a worrying gap in their knowledge of road signs - with half of those questioned unable to identify a basic roundabout sign. And then yo get all the t***s that won't let you merge in turn? It's a real problem on the roads round my way. You have people deliberately speeding down the offside lane then dangerously cutting in at the last minute (i.e. not merging in turn, just trying to aggressively get in front of as many people as they can) then people 'defending' against anyone using the offside lane, even driving down the middle of both lanes or undertaking and stopping people from moving over. It's ridiculous, and just another example of our angry, selfish society created by politicians and the media mafia who have turned our country into a war zone of resentment and fallen standards / values. Indeed - I've had people DELIBERATELY pulling out from the LH lane to stop me moving up on the outside, even though there was half a mile to go before the merge point and that I wasn't going particularly fast (40mph). This has happened to MANY other people as well. The ONLY time where it has been done 'correctly' is when someone has barrled down at 70+ and tried to force their way in via the chevronned area. This sort of thing regularly happens on long slip roads, e.g. the A1 between junctions 8 and 9 near me (Stevenage North to Letchworth) and on the M4 slip off (eastbound) at the M25. All that happens is that it creates traffic jams and contributes to several near misses. I agree that people are so selfish these days when driving. I will admit to blocking the empty lane to prevent other drivers from "pushing in at the front of the queue". Now that I understand what the Highway Code requires, and the reason why, I will convert to a pusher-in. I'm guessing the other drivers won't be happy about it though. Thanks HJ! I'm not sure I agree with the highway code because if each car had to join the back of queue then the speed of the queue would be a lot higher than one that was going stop start stop start as other cars 'push' in. I think it needs a simulation to be done on a computer to see which method is the best. It's designed to stop needless queues and traffic jams on motorways/dual carriageways, which can make it worse if everyone's in lane 1 because they are blocking people turning off by only using one lane instead of two or 1 or 2 instead of all 3. The problem comes when people don't leave sufficient gaps to allow those in other lanes to merge without having to sharply brake, a major cause of holdups and accidents. It has been proven and simulated a million times over. youtu.be/cX0I8OdK7Tk Google is easy to use. You're certainly right that there have been umpteen studies to demonstrate that - when executed appropriately - "zipper merging" is best in heavier traffic (though that youtube clip proves nothing!). However it's also broadly acknowledged that this requires a significant change in driver behaviour, and expectations of other drivers merging in turn smoothly and (crucially?) quickly. I think that's also the consensus amongst commenters here. And I still don't see how you computer-simulate that without making massive assumptions about prospective driver behaviour. The need to merge-in-turn like a zip, when 2 lanes merge into 1, is ignored by so many drivers ( probably because of ignorance of the Highway Code advice) , that I feel that the advice needs more publicity. A tv campaigns with a series of adverts is needed to make drivers more aware. I think the ignorance level is wrong; I think far more people know; they just dont give a s***. Indeed - many people think because they didn't go down the outside, no-one else will whilst they are waiting. Egos at the max. Instead of joining the huge queue waiting to turn left at a roundabout, you take the r/h lane, go all the way round the roundabout and off down the turn in front of them. I have other examples of how I legally get around long queues - people are such sheep. I passed my driving test 51 years ago and I have to confess that I became aware of the expression “zip merging” only within the last 5 years. I read about it in another online forum, oddly not a motoring one, but no matter. Once I’d read about it, I began practising it and found that some motorists observe it while others do not. I suspect that drivers who refuse to let others zip merge in front of them are ignorant of the practice, although there will always be b*****-minded drivers. Where I find it difficult to operate is on the A3 as it descends down East Hill into the Wandsworth one way system. As it passes the church on the right, the road reduces from 3 lanes to 1 and zip merging doesn’t seem to happen - it’s more a glorified carve-up with who blinks first having to let the other guy in. In the other forum I mentioned, posters were referring to zip merge road signs. I have never seen them in this country, although I did see them while driving in America last year where zip merging is normal practice. If two lanes merge into one, the traffic has to merge at some point. All you do by merging at the back is leave a massive bit of empty road. Seems fairly straightforward logic that this causes everyone a bigger delay than meeting where the actually closes - just like a two mile stretch of roadworks causes a bigger delay than a one mile stretch. Leaving aside what the HC says*, surely the cause of delay is the capacity of the single lane to process the traffic? Ideally therefore you want traffic in the single lane to be going at the maximum speed compliant with conditions and the speed limit. Zip merging just before the beginning of the single lane section would seem to cause traffic to have to adjust their speed (up and down) to allow "zipping", thereby reducing the average speed at which traffic can enter the single lane section - which reduces the capacity of that section. Merging over a longer distance before the single lane section would seem to ensure that once traffic enters the single lane section its speed has stabilised thereby maximising the throughput. Zip-merging will reduce the length of road subject to any queue (which could be important if there are junctions in that length), but I am not convinced it will minimise the time delay. * The Highway Code (www.gov.uk/search?filter_manual%5B%5D=%2Fguidance%...e) is a compendium of advice and guidance, regulations and law. Breaking the latter two can lead directly to penalties. Not following "advice and guidance" is arguable - you really need to be able to prove that you were driving with due care and attention - and following guidance and advice in the HC is one way to partially demonstrate "due care and attention". HC Rule 134 says "... Merging in turn is recommended but only if safe and appropriate when vehicles are travelling at a very low speed ..."
HC Rule 288 says "... Where lanes are restricted due to road works, merge in turn ..."
Is "insisting on zip-merging" failing to show "consideration" for other road users, and therefore grounds for not following the HC advice? So why don't the Highways Agency or whoever is in control of the roadworks, put up a sign saying "utilise all road space and merge in turn ", it can't be that difficult even for this country. Perhaps they don't really believe that "the zip-merging" is going to work? Seems reasonable to me, since I don't either. As pointed out above, the limiting factor is the single lane's capacity, and "the zip-merging" is likely to under-exploit it. Then you'll have "the zip-jam". Its all rather uncomfortably close to "the b******s". A particular annoyance is when leaving the motorway, some drivers skip past the long queue on the slip road, then try to merge into the slip road at the last possible moment. This manoeuvre involves braking sharply, forcing other traffic in the slow lane (especially lorries!) to have to brake suddenly too.